My husband and kids are used to it by now—me walking around the house and singing like I’m starring in my own personal musical. I won’t even realize I’m doing it, and my husband will comment that it’s been a long time since he’s heard that particular song. Music energizes me, inspires me to write, and gives me a creative outlet that I can share with others. I have been in one kind of chorus or another since I was in the first grade, when I started singing with my church’s children’s choir. Church, school, community chorale—the longest I’ve gone without singing in a group was the first year I homeschooled, but even then I tagged along with my parents to the Don Thompson Chorale’s rehearsals every Monday night. The members eventually got tired of seeing me sitting there and allowed me to rehearse with them. A year later, I made it to full-fledged performer, my first concert being the weekend of my fifteenth birthday. Many important events in my life have been marked by music, from the day my husband and I started dating (which happened on a chorus trip) to our wedding five and half years later (the Don Thompson Chorale sang five pieces at our wedding) to the births of our two sons (I sang a requiem the day the first was due, although he didn’t grace us with his presence for another eight days, and I performed in a concert exactly one week before the second one was born). Some of my favorite performances were in grand settings with mass choirs. I sang three times at Epcot in Disney World. My high school chorus performed in district and state festivals every spring, which allowed me to sing, among other places, at both the University of Florida and Florida State. 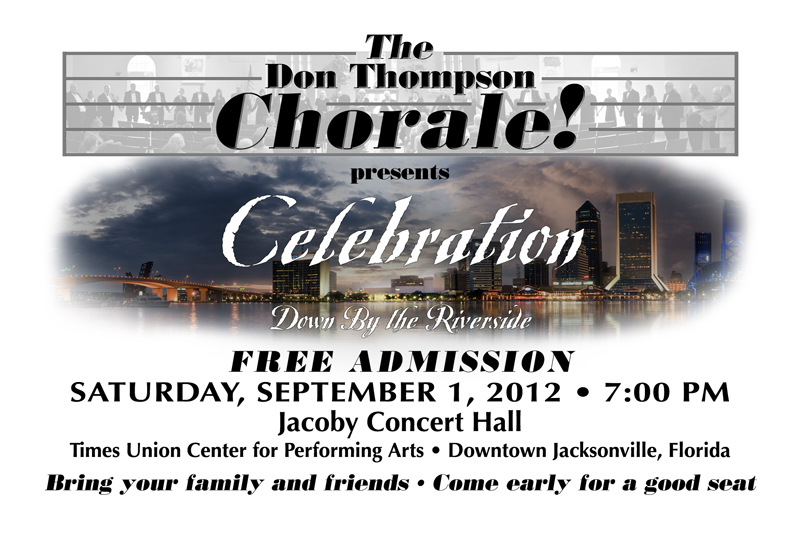 With the Don Thompson Chorale, I have performed in the Florida Theatre and the Times-Union Center. My most memorable performance was in Carnegie Hall, but before you get all impressed, I was one of at least two hundred people. Even better than the setting, our conductor was John Rutter, the composer of the Requiem we performed (that’ll mean something to you if you’re a choral buff). And now for my shameless plug—I have yet another opportunity to make wonderful memories in my near future. The Don Thompson Chorale, which has performed one hundred fifty concerts to date, is giving a free concert at the Jacoby Symphony Hall at the Times-Union Center for the Performing Arts on September first. Our previous performances there were with other choirs. This will be the first time we’ve done it on our own. And this concert is particularly special because we are celebrating our Director Emeritus Don Thompson’s seventy-fifth birthday. Students from his college directing days are joining with former and current Chorale members to provide an evening of choral fun in the River City (click here to listen to us). Oh, and by the way, it’s FREE! Check out the graphic below for details, and I hope to sing for you there. This entry was posted in About the Writer Mom and tagged Carnegie Hall, Choir, Don Thompson Chorale, Jacoby Symphony Hall, John Rutter, Music, Singing.